Implant overdentures improve the look, feel, and function of your dentures. At My Smile Artist in San Antonio, Dr. Imam and Dr. Schroder offer this treatment to improve your experience with dentures and support your oral health. While traditional dentures rest on your gums, implant overdentures are secured to and supported by dental implants that are surgically placed in your jawbone. They are also referred to as implant-supported or implant-retained dentures. 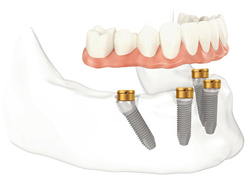 Two to eight implants can be used to stabilize your dentures. When dentures are secured to implants, they function and feel more like natural teeth. You can eat and speak without your dentures lifting, slipping, or falling out. Tooth roots stimulate jawbone. When all of your teeth are missing, your body resorbs the bone and uses the minerals elsewhere throughout the body. Implants stimulate the bone, preventing shrinkage in the vicinity of the implant. 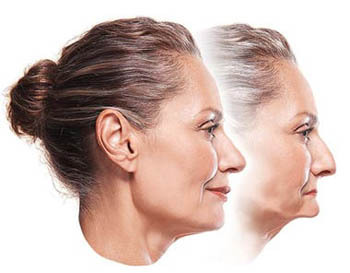 As the jawbone shrinks, it leaves facial muscles without support, which shrinks the face. This shrunken face look can make you look older, as the drawings on the right show. Implant overdentures preserve jawbone for natural facial support that minimizes signs of aging. Secure dentures give you more confidence in social settings. It’s easier to enjoy eating, conversing, and laughing without concern about your dentures dislodging and embarrassing you. Dr. Imam and Dr. Schroder have advanced post-graduate training in implant placement. Additionally, they partner with an oral surgeon or a periodontist to ensure you receive implant overdentures of the highest quality. You’ll also receive high-quality cosmetic dentures that are personalized to compliment your facial features. They will look completely natural. If you would like more information on implant overdentures, schedule a complimentary consultation with Dr. Imam or Dr. Schroder. Call us to schedule an appointment or complete our Request an Appointment form.